Adult Entertainment Expo Tow & Grow Mobile Hydroponics Trailer For Cultivating "Herbs"
The worst part of growing "herbs" in your backyard? DEA agents storming your house or getting robbed by a rival gang. Clearly, it's easier to purchase the $75,000 Tow & Grow mobile hydroponics lab and "GET ROLLIN." Because grow rooms are illegal in most places and vulnerable to theft, the fully-ventilated trailer makes a better alternative for those wishing to grow "herbs" on the run without having to tear down and rebuild their operations. 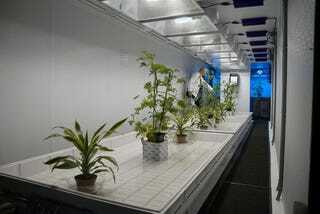 According to a company rep the 500-gallon water/nutrient tank will help grow approximately 36 "herb" plants. The "herb" growing sounds a million times classier than any meth lab we've ever seen. You can't pick one of these up at CES but rather in the Adult Entertainment Expo our mustachioed stringer seems to have accidentally wandered into.